Since Alice started school one thing that has changed is she is more aware of the latest craze that sweeps the nation. Before school I’m not sure if we just lived under a rock, but most things seemed to pass us by. And whilst I saw her friends of the same age having the latest craze, she didn’t notice and never asked for anything. In fact Alice never really asks for anything, its only been the last Christmas and birthday where she has had a very clear list of what she would like and then it’s only been a couple of items. If you have a school aged girl I’m sure that you are very aware of the latest craze that they all want. The JoJo bow! Now this isn’t just any hair bow and don’t think that you can get away with just a random bow. The JoJo bow is very different, it’s very big to begin with and it has the JoJo silver disc on it. Which Alice pointed out when I was buying just a normal bow! But who is JoJo Siwa? I’ll be honest I wasn’t too sure for a while, however I was quickly put in my place and told that she is the latest YouTube star and with an impressive 4.7 millions subscribers its clear that everyone loves her. When I was asked if I would like to review a couple of JoJo Siwa products, it was one that I knew I had to say yes to. Knowing that I would get my mum of the year badge from Alice. 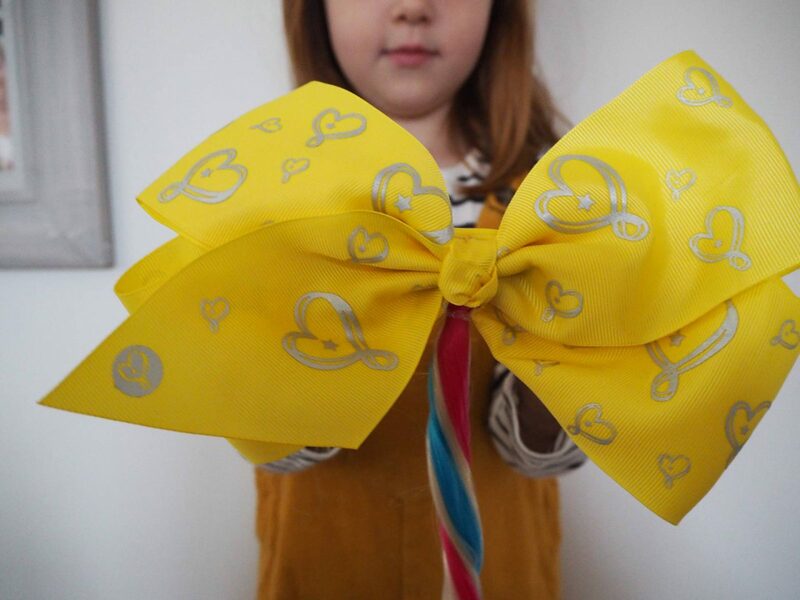 We were sent the JoJo Siwa Bodacious Bow, which is a yellow oversized bow with the distinctive JoJo hearts on it. But what makes this one different, is it has a unicorn ponytail attached. It also comes in other colours. 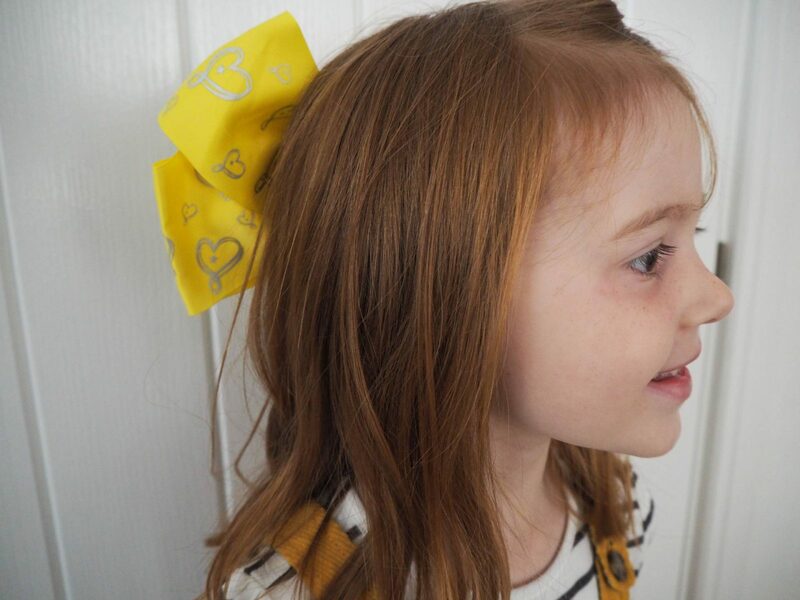 The bow has a clip that is easily attached to their hair and you really can’t miss them. Alice loved it and has now asked if she can have unicorn coloured hair. Of course that’s a no from me, but thankfully she is happy to wear the JoJo bow at home and be a unicorn. 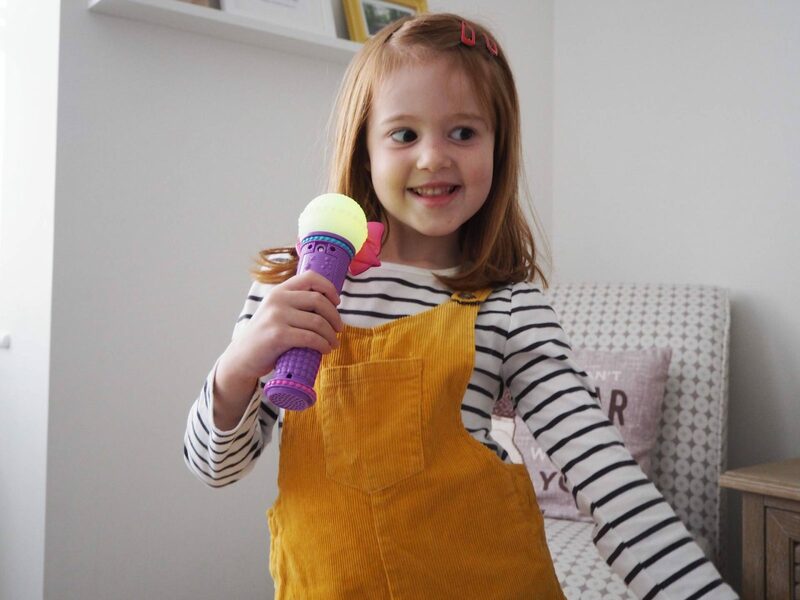 We were also sent the JoJo Siwa Microphone. 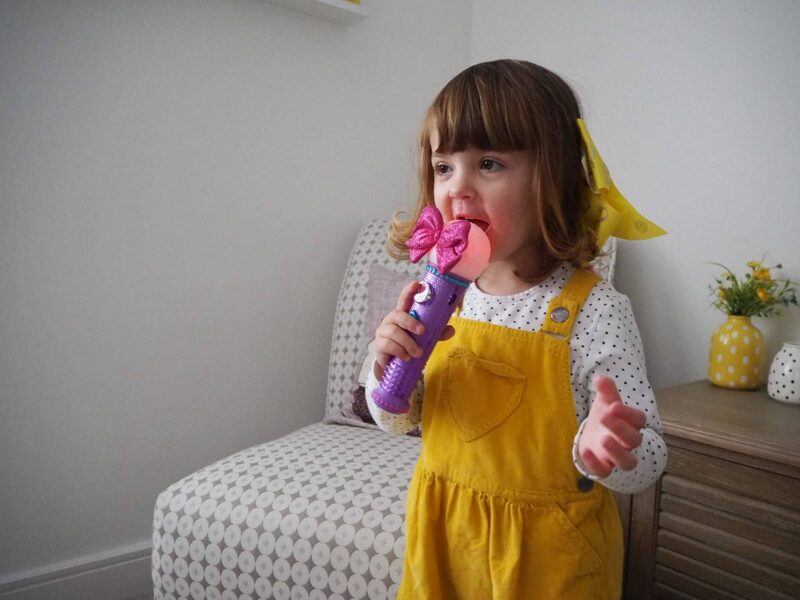 No more singing into the hairbrush for us, this microphone fits the bill perfectly. It lights up, is covered in jewels and of course it has a bow on it. It has 3 modes, music mode, working microphone mode and MP3 mode. You can sing along to JoJo’s hit song, Boomerang, or plug in your MP3 player and rock out just like JoJo. This is a big hit in our house with both my girls. Last Saturday they played with it all afternoon, putting on different shows and having lots of fun. 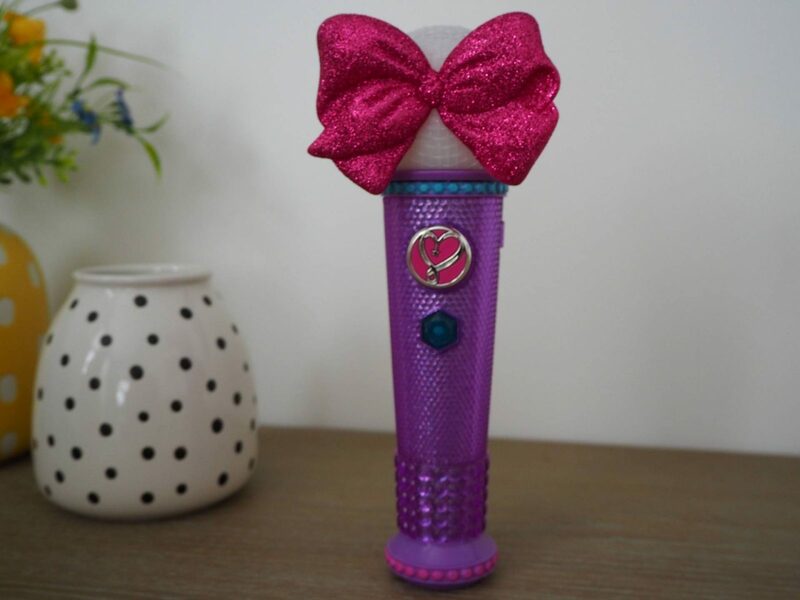 The JoJo Siwa Microphone RRP is £17.49 and is available at Amazon and The Entertainer. I love it when a toy can bring the girls together, they use their imagination and have lots of fun together. I’m sure these will be appearing on lots of little girls Christmas lists this year. 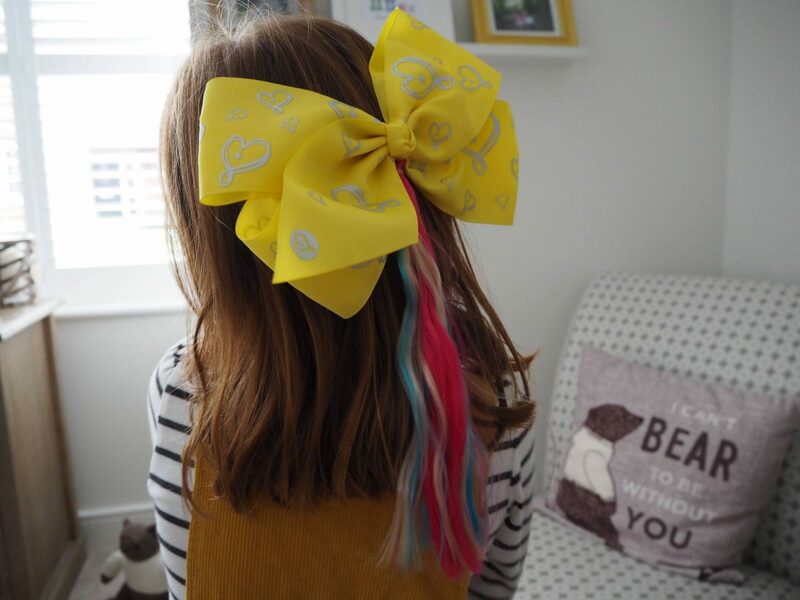 Disclosure: We were kindly sent our JoJo Siwa products in return for an honest review. All photos, views and opinions are my own. JoJo certainly seems to be taking over the world! Looks like a great gift for any of her fans. Thanks for posting. A few people have mentioned how microphones have helped their little ones build confidence, I may have to pop one on the Christmas list. 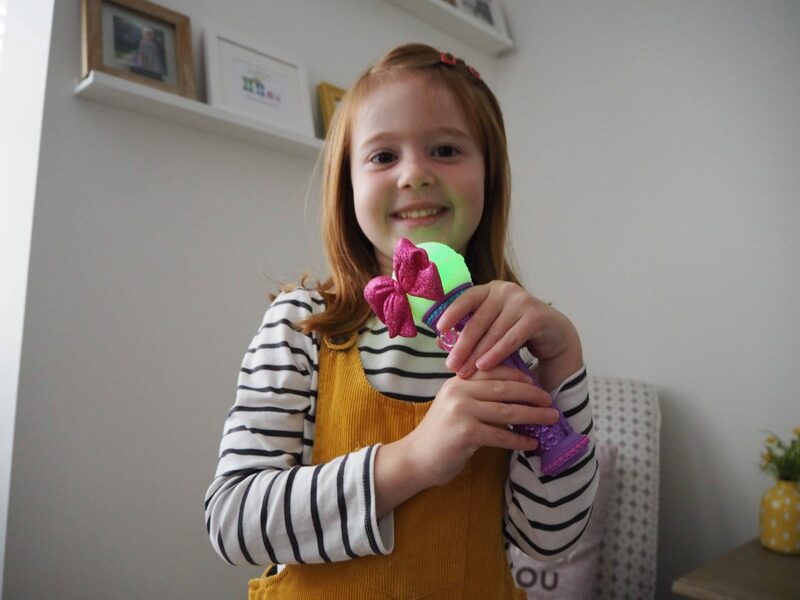 These products look fab, its great that the microphone has 3 modes so kids will never get bored! I think my little girl would love those bows too! Aww, these bows are so sweet 🙂 Lovely pictures. My Daughter still loves wearing bows even though she is a lot older. We’ve got boys microphones that have been played with until I can’t get the songs out of my head! Microphones certainly seem to spark their imaginations. I love the hair bow with the unicorn tail, everything seems to be unicorn themed recently. Oh look at that bow! So bright and puts a smile of your face. So cute. My girls are OBSESSED with that microphone!! They haven’t put it down all weekend which was initially quite sweet but then it just started to be a little annoying, haha! As much as I can’t help but think that the bows look a little ridiculous, I know that at the same age I would have LOVED them and been begging for one just as much as my girls have! !